Scientists using the Lyman Alpha Mapping Project (LAMP) spectrometer aboard NASA’s Lunar Reconnaissance Orbiter (LRO) have made the first spectroscopic observations of the noble gas helium in the tenuous atmosphere surrounding the moon. “The question now becomes, does the helium originate from inside the moon or from an exterior source, such as the solar wind?” says Dr. Alan Stern. “If we find the solar wind is responsible, that will teach us a lot about how the same process works in other airless bodies,” says Stern. If spacecraft observations show no such correlation, radioactive decay or other internal lunar processes could be producing helium that diffuses from the interior or that is released during lunar quakes. Scientists using the Lyman Alpha Mapping Project (LAMP) aboard NASA’s Lunar Reconnaissance Orbiter have made the first spectroscopic observations of the noble gas helium in the tenuous atmosphere surrounding the Moon. These remote-sensing observations complement in-situ measurements taken in 1972 by the Lunar Atmosphere Composition Experiment (LACE) deployed by Apollo 17. Although LAMP was designed to map the lunar surface, the team expanded its science investigation to examine the far ultraviolet emissions visible in the tenuous atmosphere above the lunar surface, detecting helium over a campaign spanning more than 50 orbits. Because helium also resides in the interplanetary background, several techniques were applied to remove signal contributions from the background helium and determine the amount of helium native to the Moon. Geophysical Research Letters published a paper on this research in 2012. “The question now becomes, does the helium originate from inside the Moon, for example, due to radioactive decay in rocks, or from an exterior source, such as the solar wind?” says Dr. Alan Stern, LAMP principal investigator and associate vice president of the Space Science and Engineering Division at Southwest Research Institute. 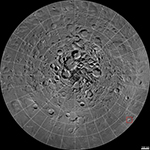 Space scientists from the University of New Hampshire and multi-institutional colleagues report they have quantified levels of radiation on the moon’s surface from galactic cosmic ray (GCR) bombardment that over time causes chemical changes in water ice and can create complex carbon chains similar to those that help form the foundations of biological structures. In addition, the radiation process causes the lunar soil, or regolith, to darken over time, which is important in understanding the geologic history of the moon. The scientists present their findings in a paper published online in the American Geophysical Union’s Journal of Geophysical Research (JGR). The paper, titled “Lunar Radiation Environment and Space Weathering from the Cosmic Ray Telescope for the Effects of Radiation (CRaTER),” is based on measurements made by the CRaTER instrument onboard NASA’s Lunar Reconnaissance Orbiter (LRO) mission. The paper’s lead author is Nathan Schwadron, an associate professor of physics at the UNH Space Science Center within the Institute for the Study of Earth, Oceans, and Space (EOS). Co-author Harlan Spence is the director of EOS and lead scientist for the CRaTER instrument.